Organic lawn care is easy. You can have a beautiful, healthy lawn without using chemical fertilizers and pesticides. You'll love knowing that your organic lawn is safe for kids, pets, and the environment. You'll also love not having to spend hours every week taking care of it. A beautiful organic lawn doesn't take a lot of work. You won't need to mow as much, because organic lawns grow more slowly. That's because synthetic fertilizers force grass to grow faster than normal. Organic lawn care encourages your grass to grow deeper roots, so you won't have to water as often. And because organic lawns are so healthy, they naturally discourage pests, diseases, and weeds. Mowing properly is the most important thing you can do for your lawn. Proper mowing can discourage weeds, cure disease, save water, and provide food for your grass. Set lawn mowers to their highest setting, or to about 3 to 3 ½ inches. Taller grass shades out weeds and encourages deep root growth. Mowing too short puts stress on your lawn, leaving it looking brown and dry. You can further avoid stressing your lawn by keeping mower blades sharp and never mowing more than one-third of the grass blades' height at a time. Also, avoid mowing when it's hot and sunny. After you mow, leave clippings on the lawn instead of raking them. Clippings fertilize your lawn and stimulate earthworm activity, which helps break down thatch. The key to successful lawn irrigation is to water deeply rather than frequently. Frequent, light watering encourages shallow roots and wastes water. Infrequent watering encourages your lawn to grow deep roots, which helps it survive drought. You can also increase the water holding capacity of your soil by spreading organic matter such as compost on your lawn. Lawns need about one inch of water, including rain, a week. But because all soils are different, not all lawns need the same amount of water. If you live in the South or have a sandy soil, you may need to water more. Unless your lawn turns brown during its active growing season, you may not need to water on a regular basis at all. Remember, your lawn doesn't always have to be green. Let it change with the seasons. Grass naturally grows more slowly in the summer, so brown grass usually means your grass is dormant, not dead. It will come back in the fall. Use organic lawn fertilizer to replenish the nutrients your grass needs. Organic fertilizers release nutrients slowly, providing a steady supply of food for your grass. And unlike synthetic fertilizers, organic fertilizers don't harm beneficial organisms like earthworms. You can find organic fertilizers at most lawn and garden centers. Fall is the best time to fertilize northern lawns. Your grass will store up food over the winter and get off to a good start in the spring. Too much spring feeding forces grass to grow too much, which can be stressful over the summer. Warm-season grasses that are grown in the South benefit from summer feedings to help them get through the summer. Good times to fertilize southern lawns are in early June and again in August. While pesticides and herbicides may kill pests in your lawn, they don't fix the underlying problems. The best way to control weeds and pests is to keep your lawn healthy in the first place with organic lawn care. If pests or disease strikes, try to correct the underlying cause. You may be cutting your grass too short or watering too much. You may want to get your soil tested to check its pH or nutrient levels. Try spreading corn gluten meal on your lawn in the spring and fall. 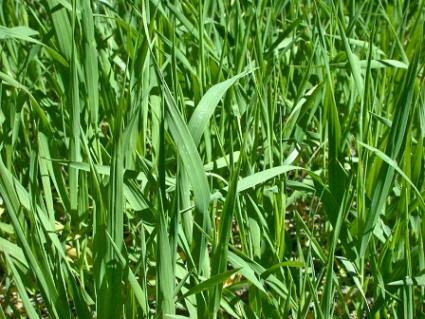 It suppresses new weeds and is an excellent slow-release fertilizer. But don't use corn gluten meal on newly seeded areas or on areas you plan to seed. It also prevents new grass from growing. Embracing organic lawn care means learning to tolerate a few pests or weeds in the lawn. When you have a pest problem, try to look at the whole picture. For example, moles-the nemesis of many lawn fanatics-are actually beneficial to your lawn. Moles often make bothersome mounds in your lawn, but they also eat grubs- pests that can kill your grass. Minimize damage to your lawn simply by pressing mole ridges flat and watering the area well. There are many exceptional, free magazine-style websites that are full of information on easy organic lawn care. Some of these resources are specifically directed toward one aspect of lawn care while others focus more on organic lawn care as a whole. The Pure Lawn Blog: This resource is excellent for people who live in the midwest United States and are interested in organic lawn care. The tips in this blog run the gamut from highly specialized to very simple, and the posts are all written in an accessible and honest way. Extremely Green Lawn Care Guide: Extremely Green is a website that's dedicated to many facets of green living, but their lawn care guide is a major focal point of the site. The subject headings are set up in a similar way to the Organic Lawn Care 101 site, but it also goes more in-depth on various lawn care recommendations and it includes a timeline of when certain things should be done to your lawn to keep it healthy. Department of Energy and Environmental Protection: This webpage is filled with tips for restoring a lawn to an organic state. There are also plenty of links to resources on various topics, such as having your soil tested and how to encourage your local officials to expand organic lawn care practices on public spaces. It can be a little intimidating to take on something new and expansive with your lawn. However, there really isn't any reason to approach organic lawn care with any trepidation. It can be a fun and enriching way to care for your lawn, and it carries with it the added benefit of being safer for you and your family. When you take the time to learn the ropes and try out new techniques for yourself, easy organic lawn care is something you can definitely handle.